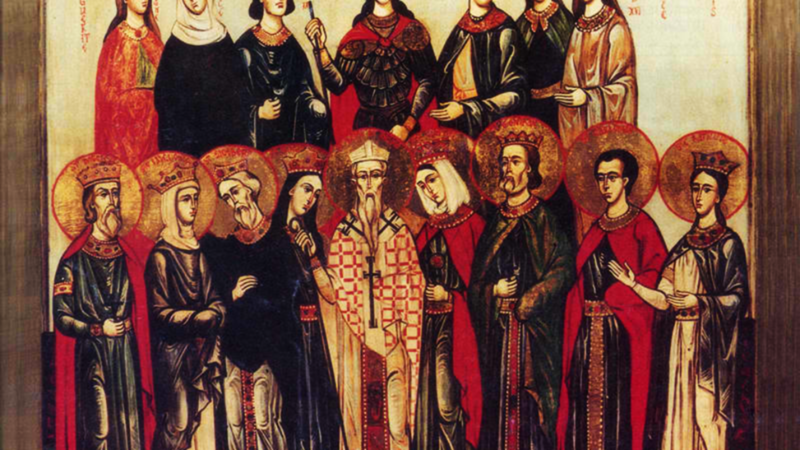 ANASTASIUS, JUCUNDUS, FLORUS, FLORIANUS, PETER, RATITES, TATIA, and TILIS, (Fourth Century), an unknown number of Christians martyred at Syrmium in Pannonia (present-day Sremska Mitrovica, Serbia). The only surviving details are the names of these eight. DIMAN (DIMAS, DIMA), a monk under St. Columba of Iona (9th June), and later Bishop of Connor in Ireland, St. Diman reposed 658. He was one of the prelates to whom the Church in Rome addressed its epistle on the Paschal Controversy and on the errors of Pelagianism. EDEYRN, (Sixth Century), the patron saint of a church in Brittany, who spent the last part of his life as a hermit. Legend says St. Edeyrn was originally from Britain and a friend of King Arthur. EIGRAD, (Sixth Century), a brother of St. Samson (28th July), he was a disciple of St. Illtyd (6th November) and founder of a church at Anglesey in Wales. FREDERICK of ARRAS, a son of the Count of Verdun, St. Frederick gave his inheritance to the Bishop of Verdun. St. Frederick then went on a pilgrimage to the Holy Land. When he returned to France, St. Frederick received monastic tonsure at the Abbey of Saint-Vanne in Verdun. He later served as Prior of the Abbey of St. Vaast in Arras, Pas-de-Calais. St. Frederick reposed in 1020. HYWYN, (Sixth Century), St. Hywyn was most likely a companion of St. Cadfan (1st November) on his return journey from Brittany to Cornwall and Wales 516. It is believed that he was the founder of Aberdaron (Carnarvon); in addition, there are several churches in the West of England known as St. Owen’s or St. Ewen’s, which may have him for their patron. There are no other details of his life extant. MACRA, a maiden from Rheims. St. Macra was tortured, mutilated, and martyred for being a Christian in Fismes in Champagne in 287, prior to the commencement of the Diocletianic Persecution. MARTYRS of NORTH-WEST AFRICA, an unknown number of Christians burnt at the stake during the persecutions under Septimius Severus circa 210. MELANIUS (MELAINE), a Breton who served as Bishop of Rennes during the time of the Frankish invasion of Gaul. Following Clovis’ conversion to Christianity, St. Melanius enjoyed a favourable position in court. St. Melanius is remembered for his great sanctity and eradicating paganism from his See. He reposed circa 535. MERINUS, a disciple of St. Donat (Dunwyd) (7th August) of Bangor, and patron saint of churches in Wales and in Brittany. He lived at some point in the sixth century; there is no further information on this saint extant. PETER of CANTERBURY, a member of the Gregorian mission to the Anglo-Saxons, St. Peter was the first Abbot of the monastery (SS. Peter and Paul — later St. Augustine’s) founded by St. Augustine of Canterbury (27th May). St. Peter was killed at Ambleteuse, near Boulogne either 607 or 614. His relics are still venerated at the location of his repose. SCHOTIN (SCARTHIN), (Sixth Century), whilst still quite young, St. Schotin left his native Ireland to become a disciple of St. David (1st March) in Wales. He later returned to Ireland, living as a hermit on Mt. Mairge in Leix for many years, St. Schotin was also the founder of a school for youths at Kilkenny. WILTRUDIS, widow of Berthold, Duke of Bavaria, who received monastic tonsure (circa 947) and founded Bergen Abbey near Neuburg an der Donau, Bavaria (circa 976). St. Wiltrudis reposed circa 986.